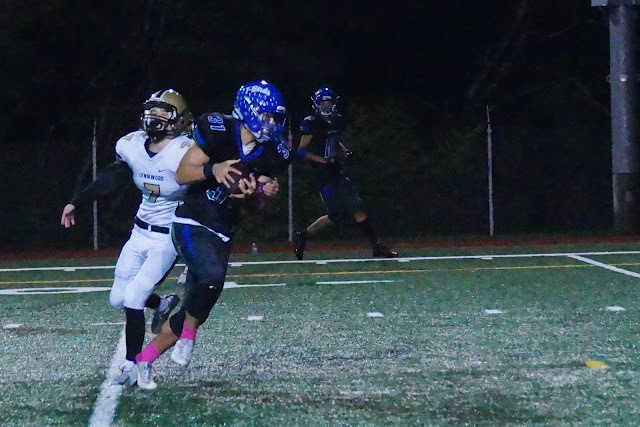 It was Senior Night for the Shorewood Thunderbirds and as students and parents gathered to cheer on a group of individuals who hadn’t seen a lot of winning in their high school career - everyone was anxious for a statement win. When a football program is rediscovering winning - at the end of the night a win is a win. But, as the final whistle blew for the WesCo South league game between the Shorewood Thunderbirds and the Lynnwood Royals - this is one win the T-bird coaching staff would surely soon forget and get ready for the next game. Although the score does not reflect the level of play - bottomline on this game - it was ugly with a capital U. Sloppy game play and mental mistakes marred the opening drives of both teams, as each committed 4 penalties and set the tone for the remainder of the game. As the night progressed - it almost seemed like the green turf of Shoreline District Stadium had turned to yellow as so many penalty flags littered the playing field and completely broke down any sense of rhythm in game play. The first quarter was scoreless, with both teams trading punts and Shorewood lost starting junior wideout and cornerback #12 Spencer Osborn (6’1/165) to a minor leg injury. At the 1:58 mark in the 1st, Shorewood held Lynnwood to a 4th and 2 and the Royals punted from their own 38. The ball sailed deep to junior return man #21 Dashawn Alexander (6’0/175) who then broke left, dancing and juking the Royal defenders and sprung down the left sideline for an apparent 65 yard punt return for six. As the T-birds celebrated in the end zone it would all be for naught, as the T-birds were called for a blindside block and the touchdown was negated. Alexander also had an interception return for 6 called back after another blindside block in the 2nd quarter. Both efforts by Alexander were electrifying as he moved around the field avoiding defenders like a character out of a Madden video football game. 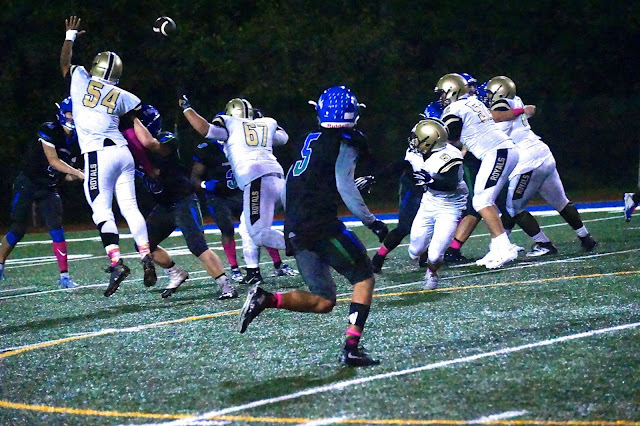 Shorewood took over on their own 40 and with some hard nosed running by senior running back #3 Robert ‘Money’ Banks, when senior quarterback #4 David Snell (6’3/175) connected with senior running back #31 Brandon Main (6’2/190) for a 28 yard touchdown strike. The PAT snap was botched and Shorewood was up 6-0 with 11:44 remaining in the 2nd quarter. Lynnwood answered on the next drive, starting on their own 37 after a 26 yard kickoff return by Lynnwood returner #5 Daniel Tran. The Royals marched the length of the field, helped by defensive penalties and scored on a 21 yard touchdown run by #9 Nate Killen. Lynnwood took the lead 7-6 but would not hold it for long. On both offense and defense Shorewood struggled to gain a sense of consistent momentum as mental mistakes and some questionable calls stymied the effort to dominate the Royals and seal the game. Yet, even with the struggles - quarterback David Snell set the tone for a focused passing attack - finding his fleet of sure handed and speedy receivers for 6 passing touchdowns. Quarter 2 - Snell to senior wide receiver #2 Jaro Rouse (6’2/185) 21 yard touchdown pass (2-point conversion good) SWH 14 / LHS 7. Quarter 2 - Snell to senior wide receiver #5 Joseph Williamson (5’9/165) 38 yard touchdown pass - SWH 21 / LHS 7. Quarter 2 - Lynnwood fumbles the punt snap, Shorewood recovers on the Lynnwood 1 with 3 seconds remaining in the half. Snell to #2 Rouse for a 1 yard touchdown pass - SWH 28 / LHS 7. Quarter 3 - #2 Rouse takes the opening kick off back for a touchdown, but it is called back due to a blindside block. Shorewood regroups and marches down the field - as Snell connects with #5 Williamson for a 35 yard completion, which then sets up a 23 yard touchdown pass from Snell to Williamson - SWH 35 / LHS 7 with 9:10 remaining in the 3rd. Quarter 4 - with 3:59 remaining - Shorewood started on their own 39 and moved the ball down the field for the final touchdown pass, with Snell connecting with Main for his second touchdown reception of the night - SWH 42 / LHS 21. 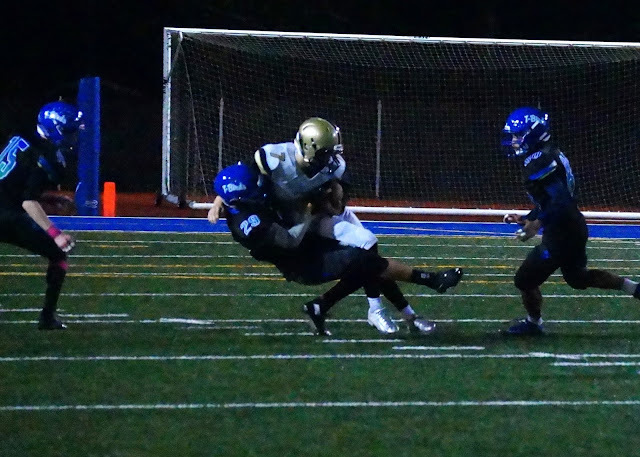 On a positive note - Shorewood only had one turnover, and had 3 interceptions - junior free safety #15 Cody Carpenter (5’7/135) and backup senior linebacker #34 Jordan King (5’8/155) coming up with picks. 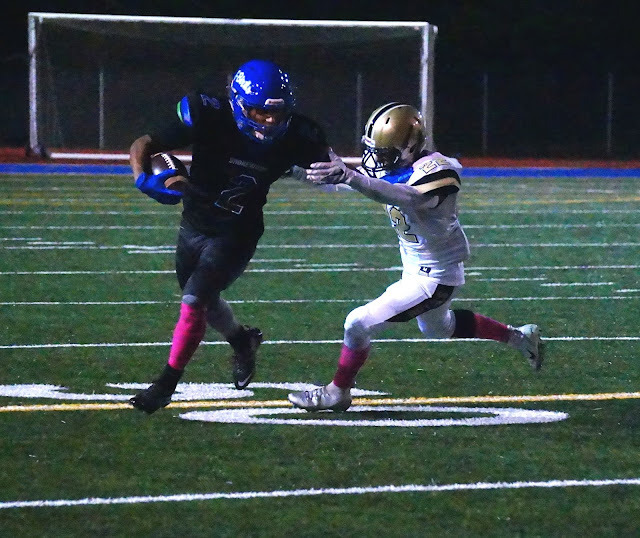 Further, the Shorewood 2nd string showed tremendous heart and fire in the second half, as the defensive substitutes did not let up on their pressure of the Royals offense. Senior linebacker #9 Ray Davis (6’0/180) had several great defense plays - including a sack and several pressures where he pursued the opposing running back and quarterback half way across the field. 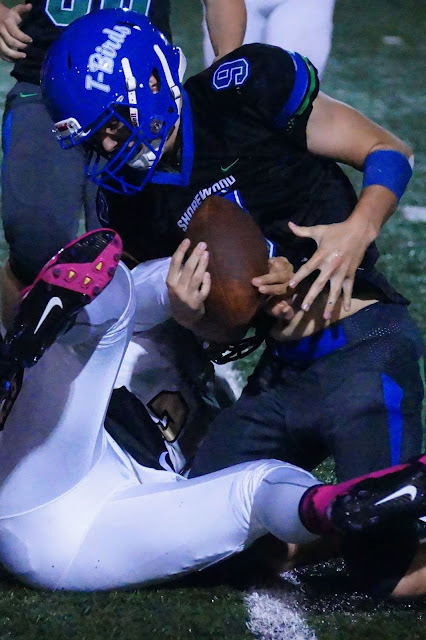 Shorewood has outscored their opponents by 107 points through 6 games. Shorewood plays Edmonds-Woodway next week in their final WESCO South League game - if Shorewood wins - they will lock a 2nd place finish and be guaranteed a spot in the week 10 state play-in game. 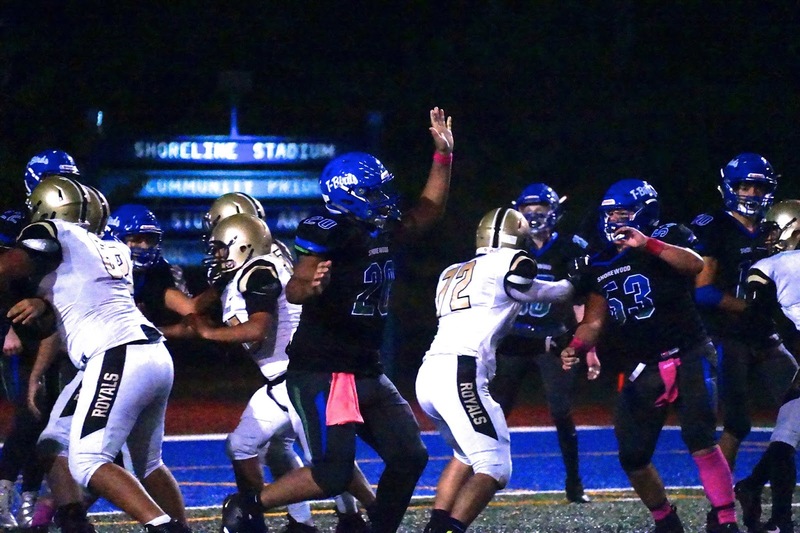 Shorewood has not beaten Edmonds-Woodway since 2003 and in the 9 loses since that time, has lost by an average of 32 points per game. Edmonds-Woodway is 1-5 overall this year, but dropped a heartbreaker to league leading Snohomish 41-35 in overtime Friday night. Suffice it to say, they will be hungry for a win against Shorewood. 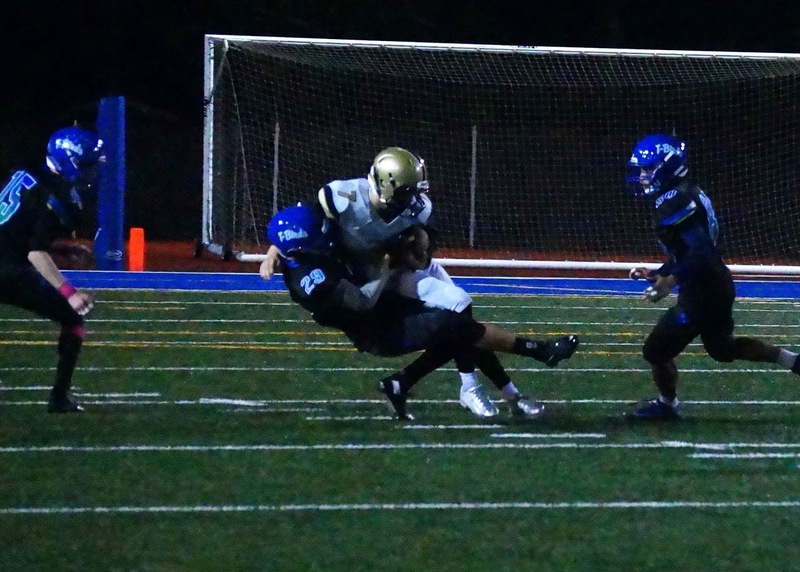 Shorewood did not give up an offensive sack all night - a definite improvement over last year, when the line gave up an average of 4 sacks a game.